This antibody is expected to recognize both reported isoforms (NP_005700.2 and NP_710142.1). Synthetic peptide corresponding to Human USH1C/Harmonin aa 2-14 (N terminal). Human Kidney fibroblast cell line 293 lysates. Our Abpromise guarantee covers the use of ab19045 in the following tested applications. WB Use a concentration of 1 - 3 µg/ml. Detects a band of approximately 75 kDa. May be involved in protein-protein interaction. Expressed in small intestine, colon, kidney, eye and weakly in pancreas. Expressed also in vestibule of the inner ear. Defects in USH1C are the cause of Usher syndrome type 1C (USH1C) [MIM:276904]; also known as Usher syndrome type I Acadian variety. USH is a genetically heterogeneous condition characterized by the association of retinitis pigmentosa and sensorineural deafness. Age at onset and differences in auditory and vestibular function distinguish Usher syndrome type 1 (USH1), Usher syndrome type 2 (USH2) and Usher syndrome type 3 (USH3). USH1 is characterized by profound congenital sensorineural deafness, absent vestibular function and prepubertal onset of progressive retinitis pigmentosa leading to blindness. Defects in USH1C are the cause of deafness autosomal recessive type 18 (DFNB18) [MIM:602092]. DFNB18 is a form of sensorineural hearing loss. Sensorineural deafness results from damage to the neural receptors of the inner ear, the nerve pathways to the brain, or the area of the brain that receives sound information. The PDZ domain 1 mediates interactions with USH1G/SANS and SLC4A7. ab19045 (1µg/ml) staining of 293 lysate (35µg protein in RIPA buffer) approx. 75kDa. Primary incubation was 1 hour. Detected by chemiluminescence. 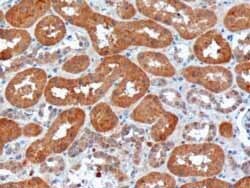 ab19045 (10µg/ml) staining of Human Kidney by IHC-P. Microwaved antigen retrieval with citrate buffer (pH 6), HRP-staining. Publishing research using ab19045? Please let us know so that we can cite the reference in this datasheet. There are currently no Customer reviews or Questions for ab19045.